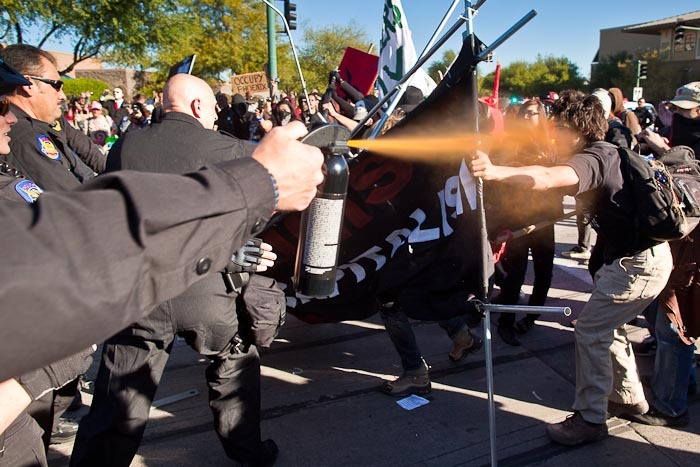 A Phoenix police officer pepper sprays a group of protesters at the Occupy ALEC protest this morning in Phoenix. The Occupy Phoenix protesters brought their battle for social justice uptown this morning when they tried to Occupy the ALEC conference at the Westin Kierland Resort in north Phoenix. ALEC is the American Legislative Exchange Council, a conservative think tank that supports private prisons, wants to do away with the EPA, and helped write SB 1070, (Arizona's tough anti-immigration law). ALEC claims tax exempt status but some progressive organizations think ALEC is a lobbying organization and should have its tax status changed to reflect that. This morning about 300 people picketed the ALEC event. Most of the protesters were peaceful and respectful to law enforcement but a relatively small group tried to blockade the resort. Police responded by pepper spraying the crowd several times and arresting a handful of people. There were also a few scuffles between police and protesters but no one was seriously hurt. There are more photos of the ALEC protest in my archive and available from ZUMA Press.